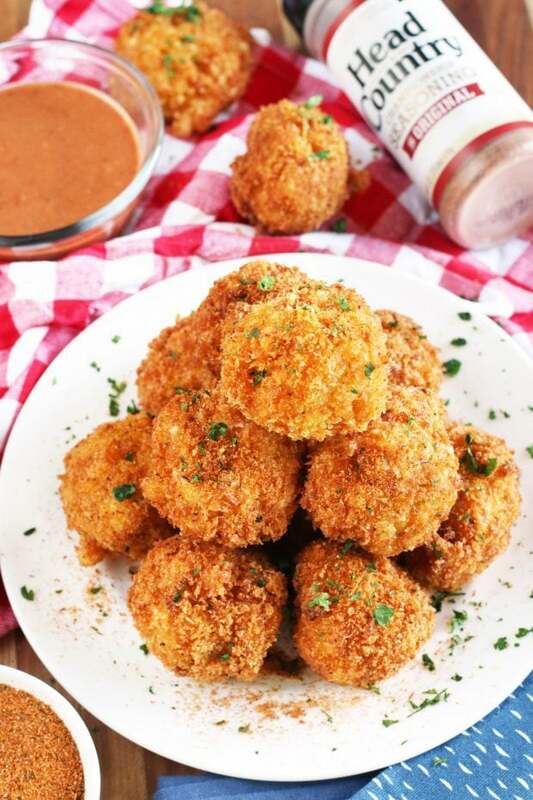 BBQ Fried Mac N Cheese Balls are balls of golden crispy goodness filled with a spicy, BBQ seasoned mac and cheese that will have you drooling. Pair this with an easy-to-make (and even easier to eat!) BBQ blue cheese sauce, and you won’t be able to eat mac and cheese any other way. Time to dig in, friends! Disclosure: This post is sponsored by Head Country Bar-B-Q. As always, all opinions are my own. Thanks for supporting the brands that support Cake ‘n Knife! When it comes to getting my snack on, I have one weakness. And if they are, let me be the first to say EW. Of course, I can only go so long before I have to create another mash up of flavors, and I have been bursting at the seams to share this one with you! These little golden balls of magic are the most delicious way to eat macaroni and cheese, and I can promise you that after one bite, you are going to have trouble going back to the normal way of devouring macaroni and cheese. 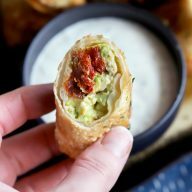 Now the magic of these bites of crispy goodness are not just magical because they are fried and packed with cheese. MY FAVORITE Head Country Bar-B-Q spices! 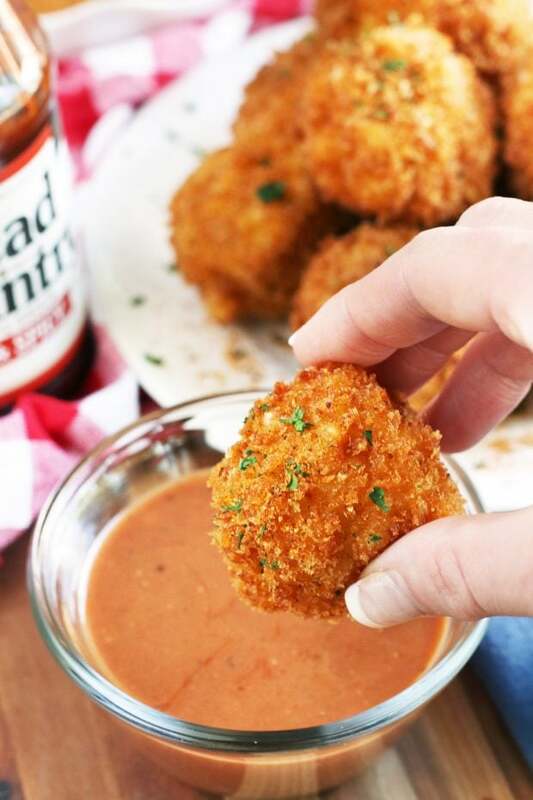 I decided to give this snack a double dose of my favorite Head Country Original Championship Seasoning so that you get a ton of flavor in every single bite. The seasoning is in the macaroni and cheese itself right when it’s made, and then it’s in the panko breadcrumbs so it exists in the crispy exterior as well! 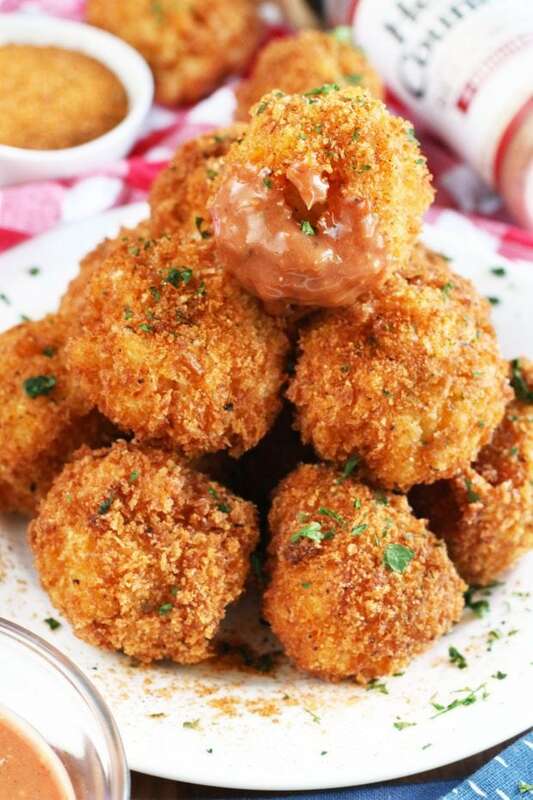 I went one step further and paired these fried mac n cheese balls with a creamy BBQ blue cheese sauce that will blow. your. freaking. mind. 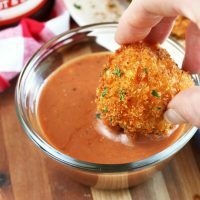 Simply mix together Head Country Hot & Spicy BBQ Sauce and blue cheese dressing, and you get a creamy, tart, spicy and tangy sauce that pairs delightfully with the rich and creamy fried mac n cheese balls. 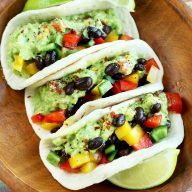 All I can say is this is THE snack that you need to be whipping up year round, whether it’s for July 4th parties or tailgating! Be sure to check out the recipe video below to see just how awesome this recipe is AND how easy it is to make! 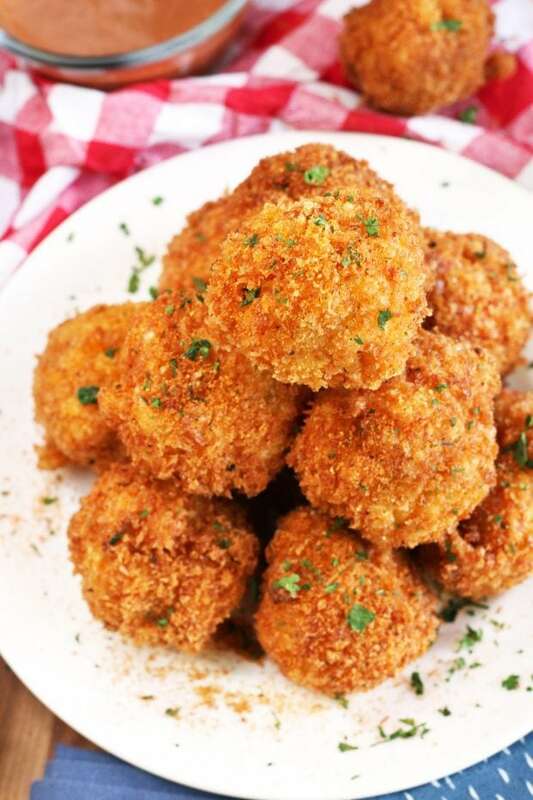 to fry up these golden delicious bites of heaven with ease! 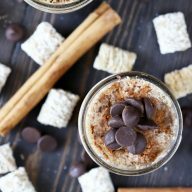 so you can make this recipe at home! Plus you’ll have some extra seasonings with that three-pack to experiment with 😉 It’s a win-win! 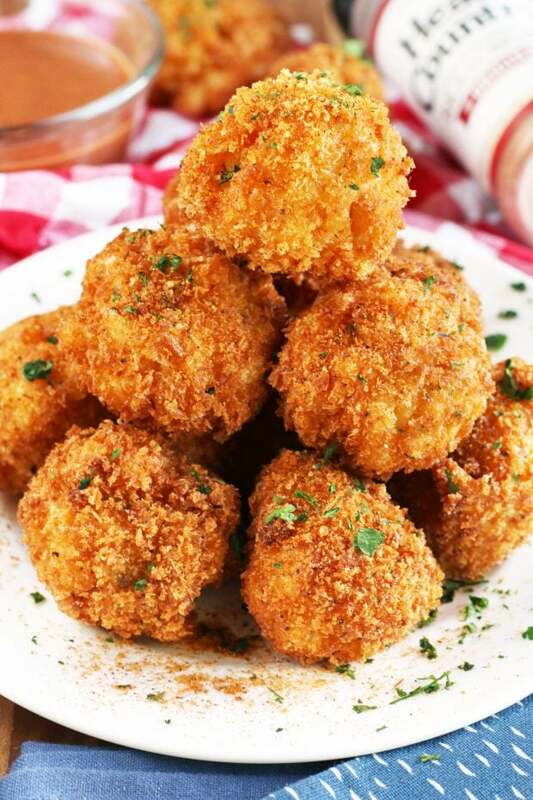 Pin this BBQ Fried Mac N Cheese Balls recipe for later! Spicy and cheesy macaroni and cheese is stuffed inside a crispy golden exterior, making it the bomb dot com snack for anytime of year! Stir in 3 tsp Head Country Original Seasoning into the macaroni and cheese. Cover the pasta with plastic wrap and refrigerate or freeze until firm (3 to 4 hours in the refrigerator, 1 1/2 to 2 hours in the freezer). Heat enough vegetable oil in a large stockpot or Dutch oven over medium high heat to be 3 to 4 inches deep. 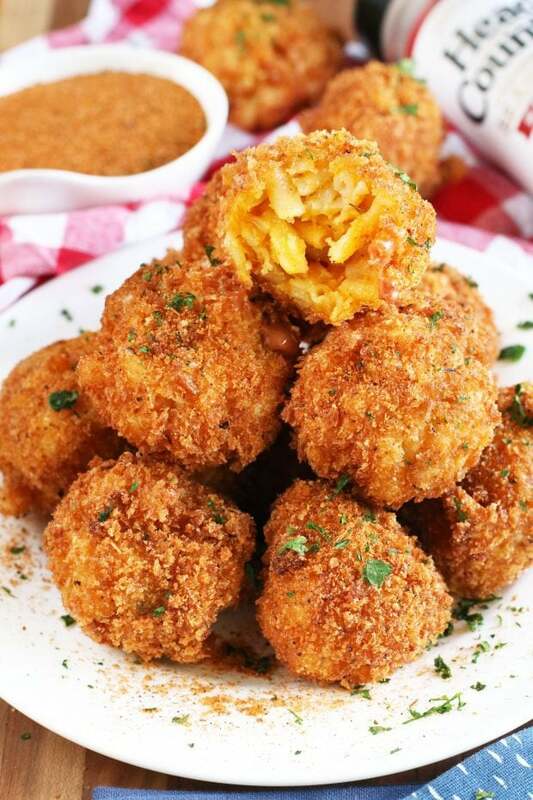 Using a spoon, take out 1 to 2 Tbsp of the macaroni and cheese to form balls. Set aside in the refrigerator until ready to fry. Combine flour, salt and pepper in a small bowl. Stir to combine. Set aside. 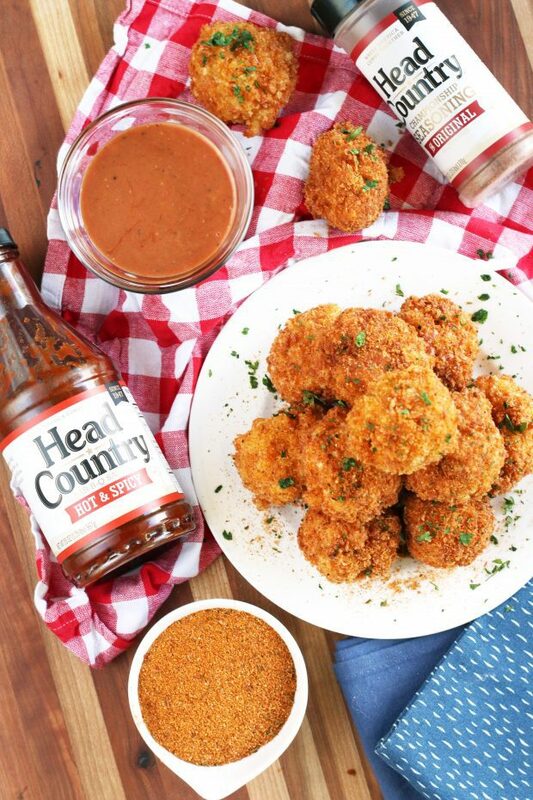 Combine 2 Tbsp Head Country Original Seasoning and panko. Stir to combine. Set aside. Working one at a time, dip balls into flour, then eggs, and finally in the panko mixture, being sure to press to coat well. Working in batches, add balls to the Dutch oven and cook until evenly golden and crispy, about 3-4 minutes. Transfer to a paper towel-lined plate. Whisk together BBQ sauce and blue cheese dressing in a small bowl. Serve immediately with BBQ blue cheese sauce.